Discrete probability distribution: describes a probability distribution of a random variable X, in which X can only take on the values of discrete integers. 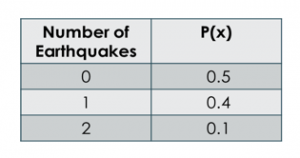 Example: Number of earthquakes (X) in the US that are 7.5 (Richter Scale) or higher in a given year. 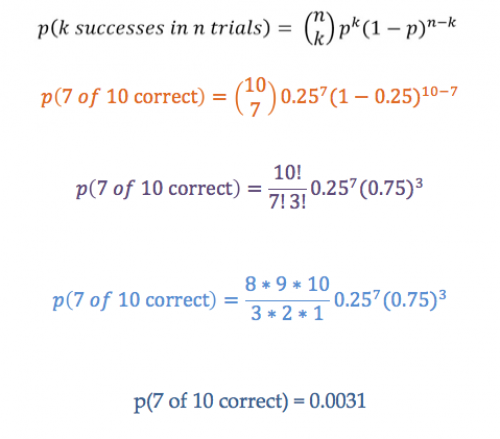 Binomial Distribution: With the discrete binomial distribution we can calculate the probability of outcomes of a set of binary independent events (often called trials) (e.g., success/failure; yes/no; presence/absence; correct/incorrect, etc.). Each trial must be INDEPENDENT (the result of one trial must not affect the likelihood of result of another trial). The probability of success must remain constant across all trials. If you flip a coin four times, what’s the probability of getting three heads? One way to solve the problem is to think about all of the possible combinations of heads (H) and tails (T) on four flips. We know that each combination is equally likely (assuming the probability of getting heads and tails are the same). 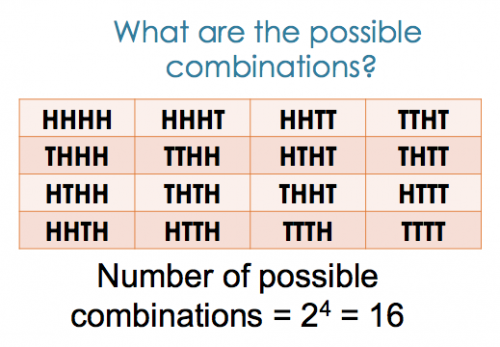 We could then count how many of these 16 combinations contain three heads. From this we count four possible outcomes, so there is 4/16 or 1/4 chance of getting exactly three heads. So this math isn’t too bad if the numbers of trials is small enough. But what if it is not? We can use the binomial distribution to solve the problem. 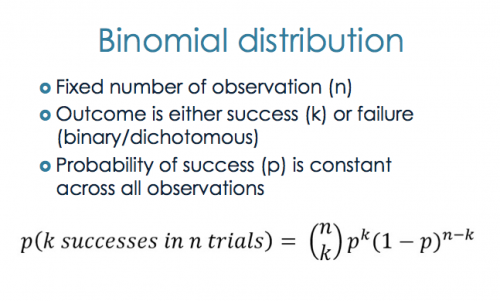 The binomial distribution is a probability distribution designed to calculate the probability of outcomes of a set of binary independent events (often called trials) (e.g., success/failure; yes/no; presence/absence; correct/incorrect, etc.). Each trial must be INDEPENDENT (the result of one trial must not affect the likelihood of result of another trial). The probability of success must remain constant across all trials. The first part of the binomial formula may look unfamiliar–this is the binomial coefficient and is often stated as ‘n choose k’). This coefficient calculates the number (integer) of possible ways of getting the result of interest out of all possible combinations. So if we flipped a coin four times (n=4), what is the probability of getting three heads (k=3)? This could be calculated as 4!/3!1! which simplifies to 4–the same result as above. Because we know that the probability of heads and tails are the same, (or that each of the 16 outcomes is equally likely) we can ignore the second half of the binomial formula with the probabilities. Now let’s move on to something a little more difficult. Fortunately, you may look up these probabilities in a binomial table. If you go to page T-9 and go to n=10, k=9 then you can scroll across to p=0.25. You will see that the probability p(X=7) = 0.0031, the same probability we calculated. or, even more easily, we could take 1-[p(X=10) + P(X=9) + P(X=8)] = 1-[0 + 0 + 0.0004] = 0.999.